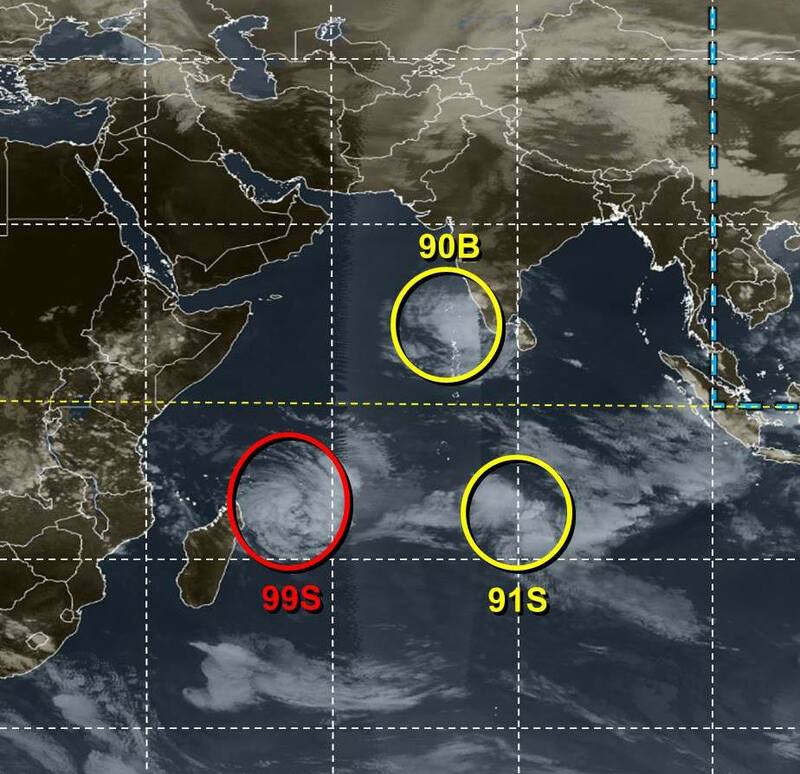 NASA is watching three low-pressure systems in the Indian Ocean today. Two in the Southern Indian Ocean and One in the Northern Indian Ocean. In the Southern Indian Ocean, the system that has the highest chance for development is northeast of Madagascar. A newly formed tropical storm near Madagascar will threaten the country with flooding and damaging winds into this weekend. Madagascar will once again be the target of a tropical system, named Eliakim, following impacts from Ava and Dumazile earlier this year. A west track through Friday will take the strengthening tropical storm near or into northern Madagascar before a south to southeast turn occurs late Friday through the weekend. This track will put parts of northern and eastern Madagascar at greatest risk for both damaging winds and flooding. Locations on high alert from this cyclone include Antalaha, Toamasina and Manakara, according to AccuWeather.com. System 92S is located in the central South Pacific Ocean near 10.5 south latitude and 134.4 east longitude, about 235 nautical miles east-northeast of Darwin, Australia. System 92S has a medium chance to develop into a depression in the next 24 hours. In the Northern Indian Ocean, System 90B has a low chance to develop. It is located west of the southwestern coast of India near 6.8 north latitude and 74.9 east longitude, about 300 miles west of Colombo, Sri Lanka.